This section of our web site is one of the primary reasons the site was set up; to provide, as much as possible, a 'one stop shop' for Pennine & Conway manuals, brochures and other documentation. Over the years, it has grown way beyond that, to include videos, articles, general memorabilia and, also, to extend the range well beyond the Pennine and Conway marques, via the Folding Camper & Trailer Tent Definitive Guide. In addition to all of these media and downloads, we also have our own, in house publication, written by Blue Sky Managing Director; Alan Young. 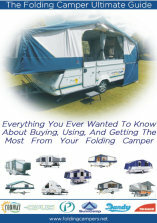 This 143 page document incorporates an amalgamation of all of our recent articles and publications and is designed to give the reader everything they need to know about buying, using and getting the most from your folding camper.